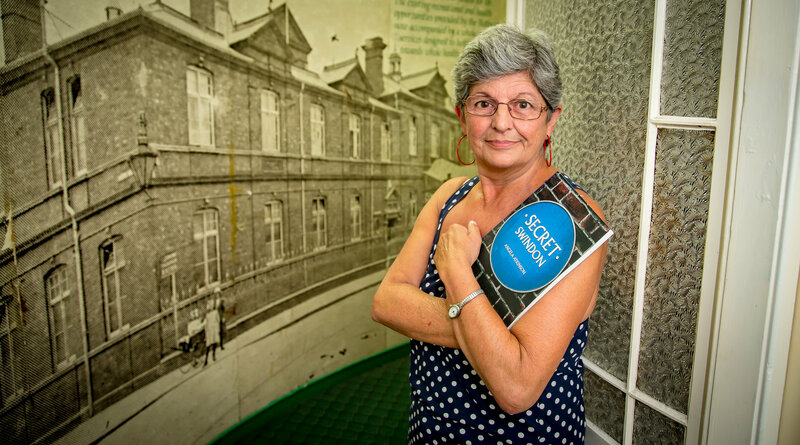 Wild Whispers, poetry film project, began with Frog on Water, a poem by producer Chaucer Cameron about connectivity/disconnect, with the backdrop of the personal – a house move – and the political – Brexit. She had this simple but ambitious idea (the best kind): send it out to her poetry collaborators across the globe one-by-one, to translate it, turn it into a film, and pass it on. Whispered. watch leap of frog, gold-green on water. Since my last post I’ve had a swim, eaten breakfast, been to a workshop, missed lunch (my bad) and given a short reading as part of a marathon open mic session. But more (or less) about that later – I’m playing a game of catchup here! 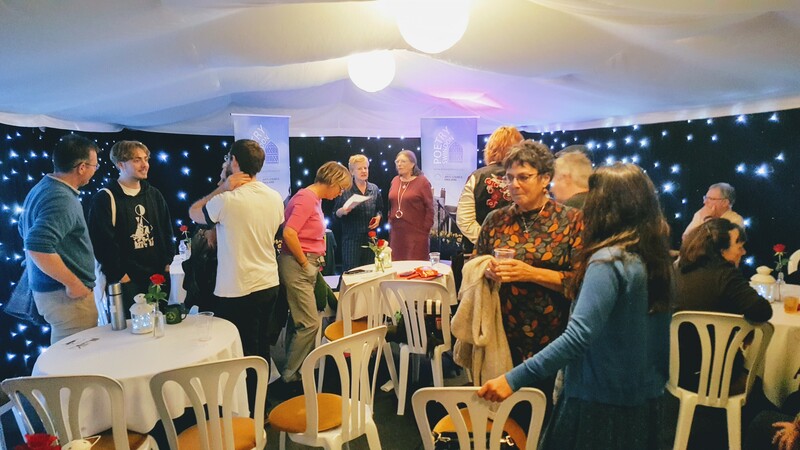 First of all … the night was young and the (faux) stars were out in the Tent Palace as National Poetry Day at the Swindon Festival of Poetry continued yesterday. Chaucer Cameron gave heartfelt introductions to three readers all with new publications: Stephen Payne, Louisa Campbell and Josephine Corcoran. 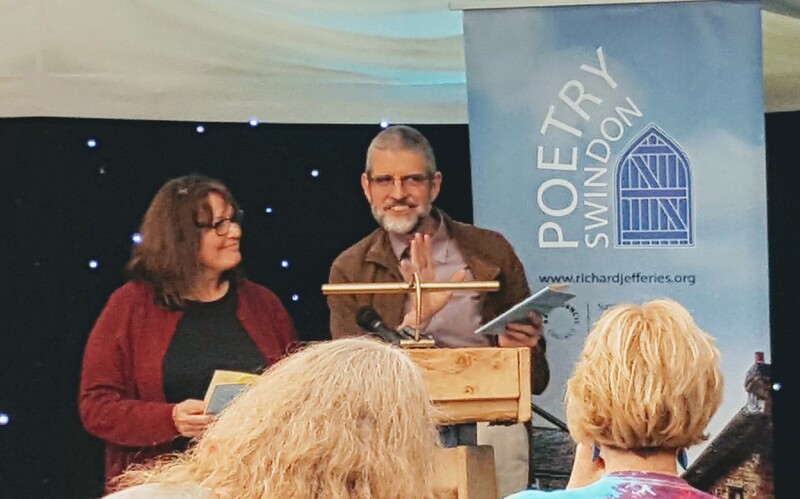 It was National Poetry Day yesterday and what better way to celebrate it than at the Poetry Swindon Festival? I’m Robin and I’ll be blogging over the next couple of days about some of the sessions, and the experience generally – alongside Festival Chronicler Louisa. I made it into the Tent Palace of the Delicious Air, on the lawn of the Richard Jefferies Museum, just as an open mic was in full swing. We heard a poem about a ‘Smart Toaster’. Angi Holden read from her collection ‘Spools of Thread’. Jinny Fisher offered a thoughtful piece on the experiences of boys in public schools. The fairy lights behind the stage blinked on and off, we broke for mugs of tea in the garden and suddenly I ran into Hilda Sheehan, Festival founder/director, back from Belgium for the weekend and looking younger and bouncier than ever. This festival is just as I remember it – quirky, warm and unpredictable. It’s four years since I was here and I’m greeted like an old friend. That’s Poetry Swindon for you. The late afternoon session saw Flarestack‘s Isobel Palmer introducing three poets with recent Flarestack pamphlets: Anna-May Laugher, Pey Pey Oh and Philip Gross. Anna-May’s background in mental health informed the powerful ‘Our house’ – presumably an ironic reference to the song by Madness, but less of a jaunty memoir than a desperately sad testimony of a young child living with his mother’s illness and its impact on all their lives. Anna-May’s set included a number of ekphrastic poems and plenty of humour too. Pey Pey Oh, whose pamphlet is called Pictograph, introduced herself with ‘English is my second language’ and some nice background about her life. Much of her set focused on the journey she took ‘wandering around China not speaking Mandarin’. These were evocative poems full of wry observation (‘the boy with the beautifully sullen face’) and all delivered with Pey Pey’s warmth and charm. We learnt she had three grandmothers, one of whom ‘had bound feet and was married to an opium eater.’ I think that detail alone would have won over the audience. The final of the three readers, Philip Gross, explained that his pamphlet Shadowplay was actually a collaboration with an Australian, Jenny Pollak, and centred on their exchanges over a period of time, in person and then by email, on the subject of light and dark. Philip explained how it was influenced by the Japanese form renga, in which poets ‘passed verses’ back and forth in a kind of sedate game of frisbee (at least, that’s the image I got!) We heard three extracts, with Isobel Palmer reading Jenny’s verses. There was a lot to think about here, from the nature of photography (‘soon we tire of it …(light) …and begin to long for the dark, its inwardness’ ‘Developing the Negatives’) to the universe itself and what we see when we look at ‘space’. Full marks to Philip and Isobel for carrying on as the mic inexplicably sagged to around knee-height, and Sam Loveless for trying to fix it from the ground-up. But by the evening any small tech hitches were a dim memory. One of the great things about this year’s festival is the proximity of everything – many of us are staying at the Holiday Inn across the road, about two minute’s walk, albeit one during which you need to stay alert. We had a health and safety briefing from Festival coordinator Helen in which she told us the only time to cross the road is when ‘you can’t see ANY cars coming’. There’s got to be some sort of metaphor here – a poetry festival divided by a road. Something to work up! Upfest celebrated its 10th anniversary this weekend with arguably its biggest coup to date. After teaming up with the Mr Men in 2016 and Morph in 2017, organisers this year announced a collaboration with The Simpsons, and their creator Matt Groening, who handpicked three artists / teams to bring America’s most dysfunctional (until The Trumps came along) family in their own style. Ignoring worries of line dancing and Dolly Parton on repeat, I left the cosy confines of my home with an open mind and an unnecessary amount of camping kit to attend the first Black Deer Festival. The festival was held in the picturesque setting of Eridge Park, reputed as the oldest enclosed deer park in England. After voicing my concerns about stags massacring the tents, I was reassured that they had been moved for the weekend and were not, as I feared, being prepared for a live fire stage cooking demonstration.